In 2014 Central England recorded it's hottest year dating back to 1659, when the instrumental temperature record started. A new study has found that the record high Central England temperatures can be attributed to anthropogenic influences with 90 per cent confidence. The syudy highlighted that the chances of record warm years in Central England has increased by at least 13-fold. "This study points to a large influence of human activities on extreme warm years despite the small region of study and the variable climate of Central England. Our analysis shows that climate change is clearly visible on the local-scale in this case." said the study abstract. The researchers used two methodologies: one based on climate model simulation, and another based on the observational record. They found agreement in the results between the two methodologies strong, "A substantial increase in the likelihood of warm years due to anthropogenic influences is found using both methods with very high confidence. This conclusion is robust especially when we consider that the two methods are primarily based on different datasets, one model simulations and the other observations." The study is a growing body of scientific work in Fractional Attribution of Risk (FAR), whereby climate events are assessed as to their probability of being influenced by anthropogenic climate change. "It is remarkable that such a substantial anthropogenic influence can be found for an annual extreme in a region as small as Central England. Despite the variability in the climate seen in this part of the world, even on annual time-scales, the anthropogenic warming signal is evident. Trends in extremes can even be detected on seasonal timescales except in winter when variability is larger. It is unlikely that such a strong anthropogenic influence would be detected on shorter timescales, such as months or days, due to higher variability. The methodologies employed here may provide a framework for further event attribution studies on smaller spatial scales than studied previously. 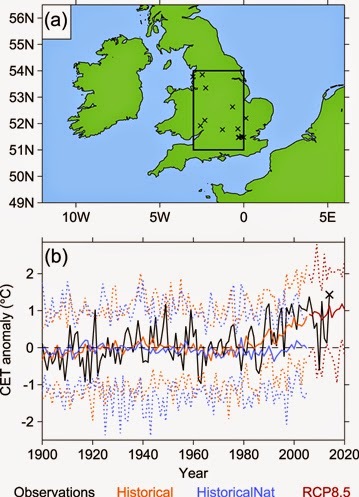 Overall, this study provides substantial evidence to suggest that the anthropogenic influence on the climate has significantly increased the likelihood of warm years in Central England. Figure 1. (a) Map with the Central England area marked (51°N–54°N, 3°W–0°E). The black crosses show the locations of stations used in the calculation of the CET at some time from 1659 to the present day. (b) Timeseries of the observed CET (black). Timeseries of the mean of the historical simulations (solid orange), RCP8.5 simulations (solid red) and historicalNat simulations (solid blue). The maximum and minimum values of the modelled CET are shown for the historical simulations (dashed orange), RCP8.5 simulations (dashed red) and HistoricalNat simulations (dashed blue). The record annual CET is marked by the black cross.